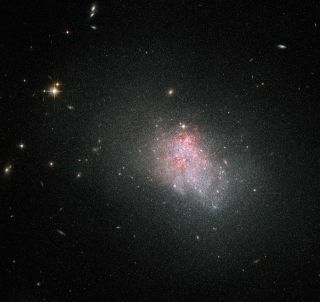 This image from NASA's Hubble Space Telescope shows the faint irregular galaxy NGC 3738, which is in the midst of a violent episode of star formation, as evidenced by the red glow of hydrogen gas surrounding the galaxy. The rate of star formation in the universe has dropped to just 3 percent of its long-ago peak, and there's no end in sight to the decline, a new study finds. A team of astronomers has determined that the rate of star birth peaked around 11 billion years ago, just 2.7 billion years after the Big Bang that created the universe. It has been dropping ever since, and the rate now stands at just just one-thirtieth its historic high, researchers said. "You might say that the universe has been suffering from a long, serious 'crisis:' cosmic GDP output is now only 3 percent of what it used to be at the peak in star production," study lead author David Sobral, of the University of Leiden in the Netherlands, said in a statement. This diagram indicates that, measured by mass, the production rate of stars across the universe has dropped by 97 percent since its peak 11 billion years ago. Sobral and his team used three different instruments — the U.K. Infrared Telescope, the Subaru Telescope in Hawaii, and the European Southern Obseratory's Very Large Telescope in Chile — to study star-forming galaxies at different distances (and thus different epochs in the history of the universe). Their survey is the most complete such effort ever undertaken, researchers said, generating 10 times more data than similar studies undertaken previously. The new study suggests that half of all stars that have ever existed were born in a boom between 11 billion and nine billion years ago, researchers said. Further, if the measured star-formation decline continues, then a maximum of 5 percent more stars will ever be produced — even if we wait forever. While many of the universe's galaxies are thus old and dying, the same cannot be said of our own Milky Way. "The future may seem rather dark, but we're actually quite lucky to be living in a healthy, star-forming galaxy, which is going to be a strong contributor to the new stars that will form," Sobral said. The new study may serve as a jumping-off point for other astronomers who wish to understand just why star formation is slowing to a trickle. "While these measurements provide a sharp picture of the decline of star formation in the universe, they also provide ideal samples to unveil an even more fundamental mystery which is yet to be solved: Why?" Sobral said. Sobral and his colleagues published their results in the journal Monthly Notices of the Royal Astronomical Society.